Remember my post about How To Make a Book Blogger Angry in 10 Easy Steps? 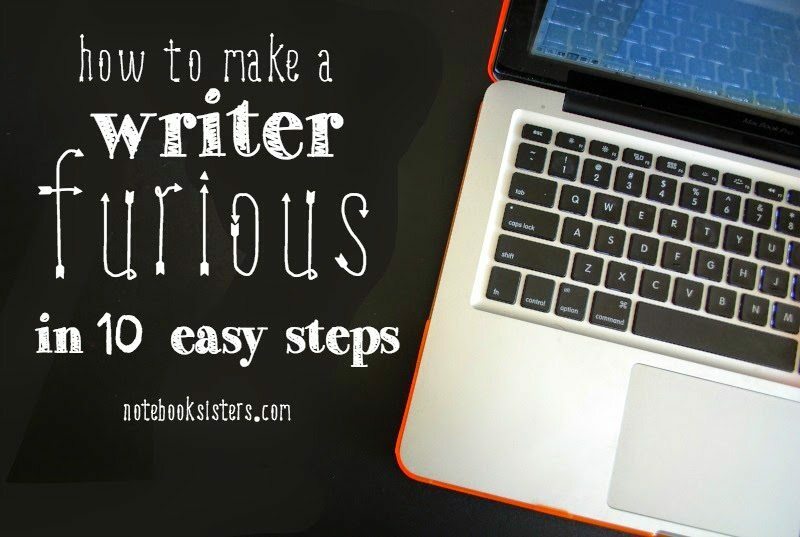 Well there are very specific instructions for how to make a writer angry (as inspired by the fabulous Emily, by the way, and if you haven’t been to her blog yet, go! go!). Mostly writers are docile creatures, kind of blinded by sunlight, and prone to make psychotic conversations about deaths of people who don’t even exist. But they, too, have a dark side if you anger them. Although if you are crazy enough to anger a writer…um…they can write you into a book and kill you. Name their villain after you. So, be careful with this list, okay? 1. Ask them when they’re going to get a “real job”. That hurts, you know? There are so many authors who successfully make a living out of selling their books. Sure, not all of them do. BUT THERE ARE STATISTICS. Plus, I think non-writers sometimes don’t realise what it’s like to switch your brain into being a different person and writing and writing and rewriting and rewriting and editing and editing until you can’t even THINK because your brain has melted. Living other lives is exhausting okay? The only thing that helps is cake and naps. 2. Ask them to get you contacts in the publishing world. 3. Ask if you can read their current work-in-progress. When a writer says “no”…let them say no! And plus, hey maybe they want to make money off their thousands of hours project and giving it to you for free isn’t cool. I’ve had this happen. I’ve said “I’m a writer” and the conversation will turn into “well, you can read some of my work and tell me what you think!”. Like they’ve just given me a huge lollipop. But at least I would be able to say “I don’t like lollipops” and not offend anyone. You can’t say that about someone’s book. Editing and beta-reading and critique-partner-ing are all very hard. Extremely hard. It’s not something you just take up in a spare moment. I pour hours of thought into my CP’s books. I don’t take on CPs unless I think we’re a hugely good match. Plus I’m so busy! I have books to write! Oh let me sob my frustration. 5. Give them aaaall the advice you can! Because gosh knows we don’t know what we’re doing! You can practically feel the violent sarcasm. I’m just going to take a moment, okay? Okay. When someone tells you they really love doing something, it’s best to assume that they’re intelligent on the subject. Chances are they don’t know everything. Chances are you might know something they don’t. But, honestly? If my sister came up to me and said, “I like cooking cakes” and I said, “Bet you didn’t know how important baking powder is!” I could expect to be punched in the nose. Expect writers (or just people in general) to be intelligent. 6. Ask why it’s going so slow? OH MY GOSH. Because writing isn’t just about spewing words on a page. It’s about making them perfect. It’s about making them sing and dance and stab and shout and cry and evoke all sorts of raging little emotions — AND IT IS IMPOSSIBLE TO DO THAT FAST. Also (just so you know) the publishing industry is slow. Getting edits from people is slow. Rewriting is slow. Getting writers block (which is a legit thing) is slow. Having cramped fingers/hands/wrists makes things slow. Being tired makes things slow. And going back to that publishing industry? It’s still super slow. I don’t even want to take a guess at the percentage of books that never even smell the popcorn of a cinema. It is highly unlikely that a book will be made into a movie. Unless your name is John Green. Then all your books will be made into movies. Like, ASAP. 8. Ask when their book will be published. If you’re going traditional, this is not something you control! Writers can’t control the length of time before they — get an agent, or an editor, or a publishing house. (Which is why I maintain it’s silly to put “get an agent” or something of the calibre on your list-of-things-to-do-this-year. It’s not something you can control!! But I digress.) It’s frustrating when you don’t know something (and are perhaps nervous about it) and people continually ask you when it’ll happen. 9. Assume they’re psychotic character-killing-maniacs. Ah ha ha ha ha haaaaa. No. I know we like to joke about it. I JOKE ABOUT IT. But I’m not psychotic myself! In order to prove this, hear me out! Only yesterday I tucked a balloon into my sister’s bed with a sticky note on it saying, “Please pop this because I am not a killer today.” I could not pop a balloon. I happen to like coffee, so you can give me some. But it’s still a vicious stereotype! Most writers I know drink tea. Some drink water. Many drink the tears of the small children they ate for breakfast. Vicious stereotype again. But I couldn’t help it. i want to hear your opinions on my 10 easy steps, by the way, peoples. add to my list! any ways to make a writer furious that i’ve missed? Cait doesn’t usually rant. SO FORGIVE HER IN THIS POST. Usually she a) flails, or b) hyperventilates over books, or c) gifs with abandon. She has been quite slacking off blogging at the moment, but this is due to her Great Blog Name Dilemma. She would like to figure it out. So far she’s bombarding her sisters with name suggestions like Paper Fury and Everyone Bow To Cait (that wasn’t met well) and Well Frankly. She’s also reading THE SCORCH TRIALS and loving it.